A 71-year-old businessman from China’s Xinjiang Uygur autonomous region has earned the nickname “The Wolf King” after dedicating the last nine years of his life to raising 150 wolves of 8 different species, in a valley that has now come to be known as Wild Wolf Valley. Yang Changsheng discovered his passion for wolves in 2007. He was visiting a friend when he noticed a caged female wolf with its paws tightly bound in manacles and chains. She looked miserable, so he asked his friend to open the cage so he could loosen the manacles. Some might say that getting so close to a fierce predator was a stupidly brave thing to do, but to Yang’s surprise, the wolf didn’t seem bothered or threatened by him, and as soon as the cage door opened, she just couched down at his feet like a pet dog. Impressed by the scene he had witnessed, his friend sent him the wolf and several wolf cubs born a few days earlier as a gift. Not long after receiving his unusual gift, someone else who had heard that he was raising wolves sent him another nine animals. His family didn’t approve of his new pets, and tried convincing him that taking care of wild wolves was a very bad idea, but he was fascinated with them, and wouldn’t hear of giving them up. In 2008, Yang applied for a license to raise wolves and spent the next years setting up an area of more than 20 hectares for them to safely live in. “At that time, we all disagreed with my father. 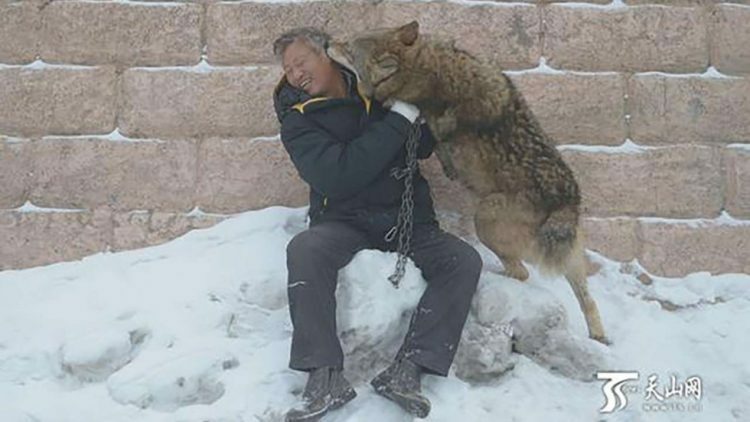 To show him how we felt, we did not even go to see those wolves,” his daughter, Yang Jie, recently told Women of China. However, after seeing her father struggling to keep his wolves healthy, Jie decided to lend him a hand. She cleaned their shelter, gave them injection and administered medication. The animals slowly recovered under her care, but she was still reluctant to get close to them, and had problems understanding the intimate relationship her father seemed to have developed with the wolves. However, one event changed her perception of the wolves completely. One day, Jie’s husband, who had been helping her take care of the wolves, took one of the animals to feature in a film. “That day, my husband went away when our wolf was asleep. After the wolf woke up, it could not find him. So it bit its chain and tried to search for him. It wasn’t until my husband came back that it calmed down and fell asleep again. I suddenly felt that it was not such an emotionless animal as I thought,” Yang remembers. With the help of his daughter, Yang Changsheng has managed to turn the original dozen wolves he received as gifts, into a pack of 150 wolves of eight different species. Over the last eight years, he has spent 170 million yuan (U.S.$ 25 million) developing the Wild Wolf Valley sanctuary, a place where visitors are welcome to see and interact with the majestic residents. Over the last nine years, Yang Changsheng claims to have only been bitten once. On that occasion, he was saved by the other wolves, which immediately grouped together to attack their aggressive brother. Other than that, the animals have only showed him love and affection. “They will attack other people, but not me,” he says. It’s almost as if they know everything he has done for them over the years. Apart from the millions invested in their sanctuary, Yang spends over 2,000 yuan ($300) a day on food for the wolves, not to mention the many medical expenses and the wages of feeders. But setting up the sanctuary with funds from his logistics business is not Yang Changsheng’s main goal. According to The Hindu, he plans to breed over 1,000 wolves and release them into the wild.